In April 2014, a World Health Organization (WHO) report warned that the world may soon enter a 'post-antibiotic era'. Outside the medical community, few, especially in developing countries, have any inkling that antibiotics, one of the greatest advances of 20th century science, are fast becoming ineffective. 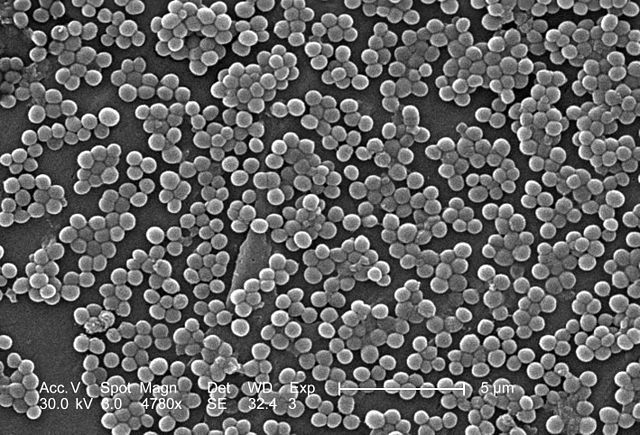 Teixobactin--that's the name of the new antibiotic, the first one discovered recently since 1987 and is being touted as the solution to an imminent global healthcare disaster that most of us don't even know about. But teixobactin or similar future discoveries may still not work in India, the biggest hub of the growing menace. Antibiotics attack bacteria causing common infections like urinary tract infections, pneumonia, cholera and tuberculosis (TB). They either block the process of building cell walls in bacteria which ruptures the cells or inhibit functions of bacterial enzymes responsible for synthesizing proteins and vitamins thereby destroying bacteria's ability to reproduce. These drugs save millions of vulnerable patients recovering from surgeries and cancer chemotherapy in bacteria rich environments like ICUs and hospital wards. However, Alexander Fleming, who discovered the first antibiotic penicillin in 1928, had warned during his Nobel Lecture in 1945 that bacteria may eventually evolve to develop resistance to penicillin and similar drugs. Since late 1980s, his prophecy began to take shape. Resistance is developed because few bacteria escape initial antibiotic attack due to evolved genetic traits over time as per Darwin's theory of natural selection. The escaped bacteria transfer strands of DNA in their genes containing these traits to vulnerable bacteria which undergo gene mutations and develop ability to fend off antibiotic attacks. Thus, the tide of this war is gradually turning. A recent review by an expert group of the UK government put a lower estimate of total deaths annually due to Anti-Microbial Resistance (AMR - technical overarching term for antibiotic resistance) at 700,000. If left unchecked, antibiotic resistance will kill 10 million people per year by 2050, more than cancer deaths today. While in US and EU, around 50,000 people died from antibiotic resistance in 2013, for India, the numbers are frightening. 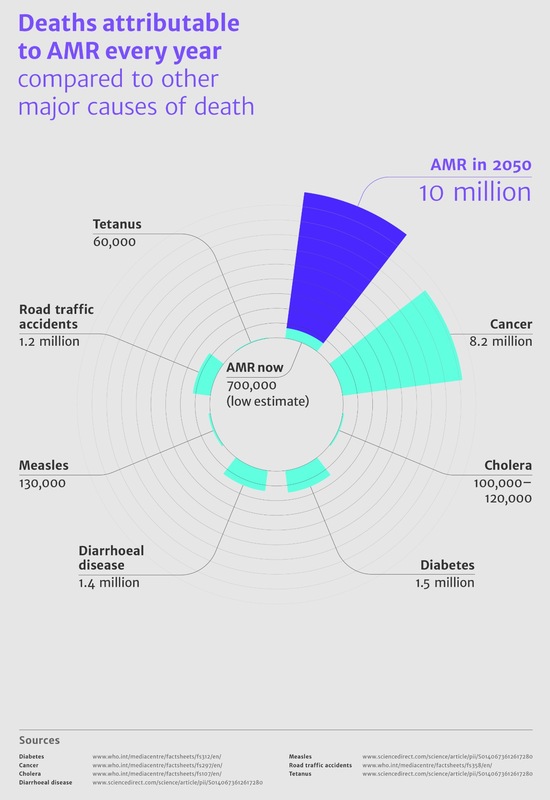 Over 58,000 children died in India in 2013 while the AMR review pegged total deaths in India from this menace at two million by 2050 if nothing is done. Dr. Harshvardhan, India's Health Minister, recently stated in Parliament that number of multi-drug resistant TB (MDR)-TB cases in India expanded five times from 2011 to 2013. Last year, colistin, the global antibiotic of last resort, registered resistance rates at four-five percent in some Delhi hospitals and a handful of cases were identified at other places. Colistin was phased out in late 1970s because of its toxicity but had a revival in India in mid 2000s due to increasing resistance (50-60 percent at some places) to carbapenems, the third and most powerful generation of antibiotics. But, teixobactin and similar breakthroughs cannot save India from imminent disaster unless steps are taken on war footing to ensure such breakthroughs are implemented effectively. Antibiotic resistance in India has two dimensions--pre-infection and post infection. The pre-infection causes relate to both humans and animals. Firstly, a large population cannot be immunised because of existing conditions like diabetes, heart diseases and cancers. Then, India has the world's highest number of people (594 million in 2012) defecating in the open which are breeding grounds for bacteria and viruses. Our ill-equipped government hospitals and health centres fare no better. In Rajasthan, a UNICEF survey of 94 district hospitals and health centres revealed 78 percent had no soap, 70 percent had contaminated water and 67 percent of all toilets were sanitarily unfit. The problem is compounded by incessant antibiotics use in poultry and animal husbandry. A June 2014 notification by India's agriculture ministry highlighted how indiscriminate antibiotics use especially in feeding poultry and animals to increase their weights left antibiotic residues in dairy and meat products. Post consumption, these residues can develop antibiotic resistance in humans. In fact, Delhi based science NGO Centre for Science & Environment's (CSE) 2014 study of chicken samples in Delhi-NCR had found 40 percent of samples with antibiotic residues. The post infection scenario is no better. Doctors in millions of private clinics and small hospitals prescribe excessive antibiotics owing to all illegal culture of 'gifts' (read commissions) from drug companies. The most ignorant practice is antibiotic prescriptions and over the counter sales for common cold, flu and sore throat, caused overwhelmingly by viruses not bacteria. A 2012 circular by drug regulator Central Drugs Standard Control Organization (CDSCO) estimated that 70-80 percent of antimicrobial drug prescriptions by healthcare providers were probably unnecessary. In 2007 only, a CDSCO study of market data stated that 1800 out of 2000 brands of fixed dose antibiotic combinations had wrong or unnecessary compositions. Fixed dose combinations are drugs with compounds aimed at multiple ailments and carry higher risks as wrong combinations can be dangerous inside the body. India came out with an antibiotic resistance policy in 2011. But it has rarely moved beyond paper due to wrangles between ministries and departments. Hence, the nexus between drug makers and health officials continues unabated. The only solution lies in a strong antibiotic regulatory mechanism ensuring accountability of health officials in implementing focused antibiotic use. Both over the counter sales and prescriptions of antibiotics especially for cold, flu and sore throats must be banned. On the pre-infection front, missions like Swachh Bharat Abhiyaan must proactively involve state governments, local communities and municipalities to ensure upgrading of hygiene and sanitation standards. Government must ban antibiotics critical or dangerous for humans in poultry and animal husbandry and restrict general antibiotic use as a feed additive. However, ensuring sufficient toilets and sanitation facilities for such a large population remains the greatest challenge. This can only happen by sustained increase in public healthcare spending (central govt. healthcare budget was shockingly cut by 30 percent for 2014-15 recently). While India may not discover a breakthrough antibiotic in near future, it can certainly ensure it doesn't lag behind in adopting from others and effectively using it to save millions.